I don’t know about you, but the back-to-school season has put me in a purging mood. I went through my daughter’s clothes to change over from summer stuff and of course there’s lots she won’t wear again. And then there’s her toys. And my husband’s random electronic objects that I don’t think we’ve used in years. As a green mom, sometimes I feel ashamed of all the stuff that’s accumulated! 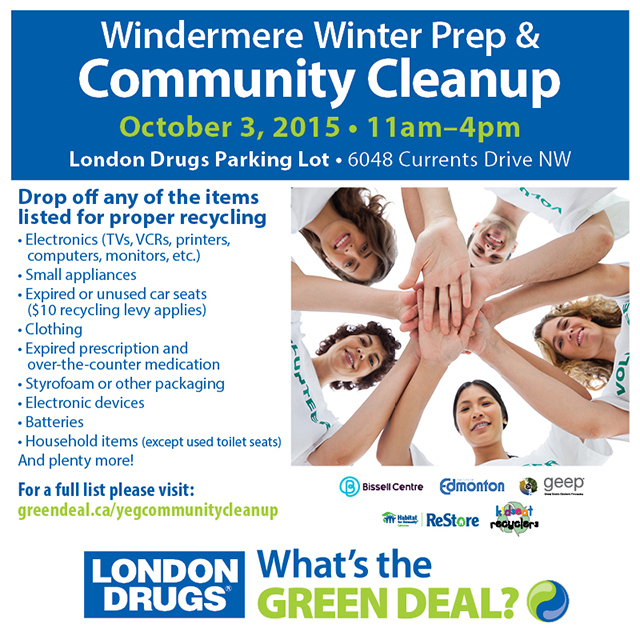 Good news – the Edmonton Windermere location of London Drugs has partnered with Habitat for Humanity ReStore, Bissell Centre, the City of Edmonton, GEEP, and Kidseat Recyclers for a Winter Prep & Community Cleanup on October 3, 2015! You’re probably used to doing spring cleaning, but what about a fall purge before the snow comes? Get rid of those old Christmas lights collecting dust that you have been meaning to replace! Recycle and donate the excess stuff in your house so you can feel calm and uncluttered this winter. London Drugs will be take styrofoam, batteries, compact fluorescent light bulbs, inkjet/laser cartridges, and expired prescription or over the counter medications and health supplements. Habitat for Humanity ReStore will take books, furniture, appliances, and house building materials to be resold and reused. The Bissell Centre will take small household items, clothing, accessories, bedding, and more to be sold in the Bissell Centre Thrift Shoppe. The City of Edmonton will be on site to help you figure out what to put in your recycling blue bag, and what you should bring to an Eco Station. GEEP (Global Electric Electronic Processing) will take “anything with a motor or cord” for recycling. Kidseat Recyclers will take used and expired car seats (fabric and straps removed) for recycling ($10 recycling levy). That pretty much covers everything in your home that you could possibly get rid of! So if you’re in Edmonton, come out on October 3, de-clutter, and do some green good! What will you bring to recycle, donate, or dispose of?